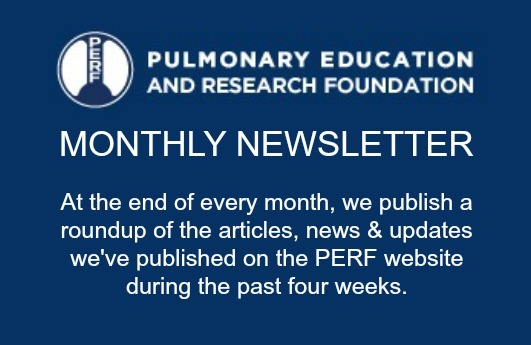 PERF is a small, but vigorous and dedicated Foundation to provide help for patients with chronic respiratory disease through education and research. PERF focuses on practical projects which, in the short term, bring benefits to patients with pulmonary disease. PERF has an extremely low overhead (less than 9% over the past 5 years), and the Board of Directors and Medical Advisors receive no financial compensation for their work. Your contributions go directly to research and education. To contribute to the scientific basis for the practice of pulmonary rehabilitation. To promote the clinical application of pulmonary research for improved well being of respiratory patients. To assist in developing and supporting pulmonary research for improved well being of respiratory patients. To assist in developing and supporting pulmonary rehabilitation programs. To increase public awareness of pulmonary disease and potential benefits of pulmonary rehabilitation. PERF has made significant strides in a short period of time. There are thirty million people who suffer from chronic respiratory disease in the United States alone. It is among the few disease categories that continue to increase in numbers every year. There are many physicians who are unaware of how much can be done to help these people who often suffer in silence and quiet desperation.